1. 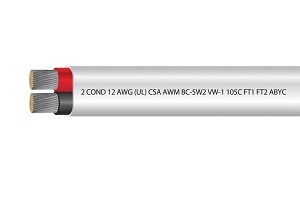 What Makes a 1 AWG Cable Special? 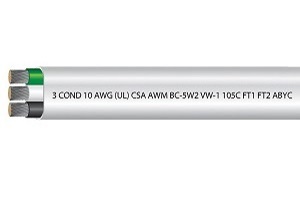 1 AWG cable is very thick, being on the lower end of the AWG (American Wire Gauge) measurement specifications. If you’re not familiar with AWG measurements, the smaller the number of the gauge, the thicker the wire. 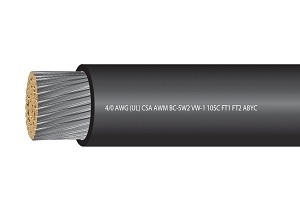 A 1 AWG cable is 7.348mm in diameter and offers considerable ampacity, making it the ideal choice for jobs that require higher electrical currents. 2. How Is 1 AWG for Flexibility? As a general rule of thumb, the larger the cable, the less flexible it will be. This makes thicker cables, like 1 AWG welding cable, less ideal for tight spaces where you’ll need more give in your lines. In addition, the heavier insulation often needed to securely use higher ratings of electrical current also often comes with the downside of being less flexible. Always be sure to think carefully about your flexibility needs before you buy. Some higher-end cables incorporate very high strand counts, which can counteract the inflexibility of larger and more insulated cables. However, higher strand count cables tend to run more expensive than medium strand count cables. 3. Will the Thickness Effect the Maximum Length? In general, thicker wires enable your cable to run considerably longer distances. This principle arises from electron flow, which makes up the fundamental function of electricity. The thicker a wire is, the more easily electrons can flow through it. What this translates to is lower resistance over the course of greater distances when using thicker wires. 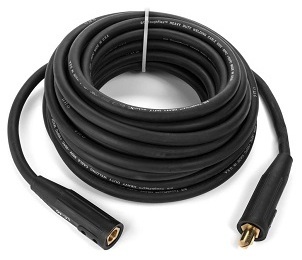 If you have a job where you’ll need extra long cables, considering 1 AWG welding cable is a good idea. Always be sure to consult manufacturers and major industry authorities before making a decision, as certain cable types might not be appropriate for your environment. 4. How Does Cable Thickness Affect Cost? In general, the more copper strands that is used in a cable, the greater the cost will be. There are of course variations depending on brand, insulation, thread count, and even material makeup. For some uses, you may not need extremely heavily insulated wire, which may result in a cheaper cable. While 1 AWG cable is certainly pricier at a baseline than thinner cables, it doesn’t have to break the bank. 5. Where Should I Buy 1 AWG Cable? While the process of finding the right shop for you is an undeniably personal process, a great place to start would be EWCSWire. Loved by tradespeople of all stripes, EWCSWire has been in the cable business for years, and their professional team will impress you with their knowledge, insight, and experience. They’ve worked with leaders of big jobs and small jobs alike, and you might be surprised by just how much help you can get without ever having to step inside a brick-and-mortar store. Their shipping policies are tough to beat, so you’ll be sure to have the supplies you need when you need them. Check them out online today! Despite appearances, not all AWG Marine Battery Cable is constructed the same. This also applies to how the base materials used in the cable are acquired and engineered into the product. Electrical Wire and Cable Specialists (EWCS) design and engineer their products for the tough demands of the marine environment. Utilizing only the best in base metals and other components which go into their marine battery cable, EWCS insures their customers will receive the best product on the market. Marine conditions require special design and engineering due to the harshness of the environment in which they are utilized. EWCS uses materials that are resistant to corrosion, acid, weather, alkali, abrasives, gasoline, moisture, and oil. Because of the nature of marine installation, EWCS makes their AWG Marine Battery Cable highly flexible and easy to install. It comes in black, red, green white and yellow for the single conductor and in white jacketed for the two and three conductor flat cable. Today’s working environments don’t allow much time to waste or money to waste. EWCS understands this challenge and makes it much easier for electricians, marine electrical contractors, and marine architects to get all the materials they need for their project in one place. Connectors, lugs, flange spade terminals, shrink tubing and more can be ordered along with the needed cabling. It is “One Stop Shopping” on an industrial scale. It seems like there is no such thing as a “standard” install. Frustration and anxiety are the children of custom installations. But with EWCS on your side, you can adapt to those custom situations with ease and comfort. EWCS can supply those one-off, custom designs which can make an impossible installation possible. With seven service centers spread out across North America, EWCS can meet customer demands more easily and more readily than many of its competitors. Added to the value of having closer shipping points is EWCS’ free shipping program. Adding even more value is EWCS’ delivery of orders in two days. Free two day shipping is hard to beat and further evidences EWCS’ commitment to its customers. Our customers give us five stars when it comes to doing business and ordering products for their projects. EWCS takes great pride in being a US manufacturer with its products and materials sourced only in the USA. Some manufacturers offer lower prices because their products are made offshore, not EWCS. We eliminate the distributor and sell factory direct to our customers, saving both time and money. Give EWCS a try; you’ll be glad you did. Call or go online at ewcswire.com and learn why our customers have stayed with us for a quarter of a century. Many contractors and electricians are familiar with Belden Fire Alarm Cable as it has been utilized in many projects for many years. Belden has set a very high standard for their Fire Alarm Cable products and offers a wide variety of products for use in residential and commercial building projects. Belden also offers the above sizes and configurations in NPLF and FPLP as well as in power limited and non-power limited specifications. Belden company has been manufacturing and supplying cabling products like their Fire Alarm Cable since 1902 and is recognized as a world leader in signal transmission cabling and wiring. Electrical Wire and Cable Specialists (EWCS) are proud to supply Belden Fire Alarm Cable along with their own products to provide their customers with the finest equipment to meet their customer’s needs. 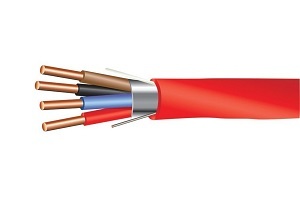 As a wire and cable product supplier, EWCS knows what it goes into quality design and engineering a high-value product and when it comes to fire alarm cable there’s nothing better on the market. And EWCS knows quality when it sees it. EWCS will call upon manufacturers to meet specific engineering specs on a cable if needed. In those cases, EWCS doesn’t want their customers searching for a separate vendor to place their order and that’s why EWCS offers the Belden Fire Alarm Cable in its product line up. Electrical Wire and Cable Specialists aren’t going to change the game when its customers order products provided by a separate vendor. EWCS still offers its customers their famous Free Two-Day Shipping on their order, regardless of the products delivered. Customer service doesn’t take a holiday when someone else’s product is in the order. EWCS still offers the same high-quality customer service and attention to detail as always. EWCS also provides a full line of connectors, flange spade terminals, lugs, and shrink wrap to complete the order for electrical supplies and wiring. All EWCS products are tested and designed to fit seamlessly into any project or design configuration. For a quarter of a century, EWCS has been providing quality materials to projects all across North America. They succeed where others fail by having seven service centers spread across North America to support their customers and provide their customers with the highest-quality equipment. Belden Fire Alarm Cable meets EWCS’ stringent requirements for product design and engineering and like all of EWCS’ products, it is made in the USA. Despite the claims of other manufacturers, Electrical Wire and Cable Specialists’ (EWCS) Security Alarm Cables are made to be the best available. There are several reasons why. EWCS manufactures their Security Alarm Cables in the United States from metals and materials sourced in the USA. Many other companies source base metal and materials from offshore vendors to keep their costs low and their profit higher. EWCS isn’t willing to sacrifice quality to make an extra buck or two. By incorporating better quality components to manufacture and assemble their cables, EWCS is able to provide their customers with the highest-quality products. That’s important if you want to keep your customers your customers. Paying attention to the details means fewer problems, both for the customer and for the company. The copper wiring that goes into the conduit wires in the cables has to be flawless. Otherwise, there may be a signal breakdown or fracture in the wire reducing or completely eliminating the wire’s conductivity. Cuts and nicks on the surface of the copper are the result of inferior manufacturing and quality control. All EWCS Security Alarm Cables come with aRed PVC Jacket or Low Smoke Plenum Rated Jacket, Nominal Diameter of .176″, Sequential Footage Marking, and Rip Cord to Facilitate Easy Stripping. The quality of the products makes for a good deal. When the quality of the company is factored in, the deal gets better. For a quarter of a century, Electrical Wire and Cable Specialists has been providing the best products to its customers. EWCS adds even more value by maintaining and operating shipping from a network of seven service centers across America. And then they add even greater value by having free two-day to three day shipping on all their products. The last and final part of the deal that makes it impossible to pass up is that EWCS sells factory direct to its customers. No distributor or middleman to mark up the products an extra 40% to 50%. Quality Products + Quality Company + Free Two-Day Shipping + Factory Direct Pricing = Fantastic Deals! There’s actually more to the picture. EWCS can custom manufacture special order products and they sell all the needed accessories to complete an order. And there’s one more thing; large quantity order discounts. Add it all up and you just can’t beat the deal EWCS brings to the table. EWCS is proud to manufacture and sell its products in the USA. In a time when the value of offshore products is under close scrutiny, it’s good to know EWCS doesn’t cut corners by using any offshore metals or materials. Made in the USA means a lot to EWCS’ customers because they know they can count on the products they order from EWCS to perform for the long term. That means peace of mind. At EWCSWire, we take pride in our work. We knew what we wanted to accomplish with our business, and we’ve done just that. Technicians around the country work with the toughest jobs around, and the last thing that they need is a hassle. Having to shop around for every different cable and wire is frustrating; some places seem to lack quality in certain departments and excel in others. We think that should be a thing of the past, and that’s why we make sure to stock up on all the best quality cables and wires. Our selection is both extensive and high quality, and you’ll be able to get what you need for a job well done. Finding the right flexible welding cable for the job is hassle free when you buy from us. We’ve got every kind of wire and cable that you need to succeed, and that’s good news for you and your customers. Whether it’s flexible welding cable or marine battery wires, we’ve got your back. That’s what makes EWCSWire the number one source for all of your wire and cable needs. Why bother shopping around when you can find everything that you need in one place? When quality and selection meet, a fantastic service is born. That service is EWCSWire, and if you’re a technician, you’ve found your home! Looking for fire alarm cables? There’s nothing more important than safety, and the very function of a fire alarm is proof of that. However, using faulty materials in the installation of a fire alarm could lead to serious disaster; that’s something that we’d all like to avoid. With the heightened quality in materials that you’ll find at EWCSWire, you’ll never have to worry about a faulty wire. There’s nothing more important than function, and all of our materials maximize function and do the job that they’re meant to do. That’s the kind of dependability that you’ll come to expect when you shop with us. EWCSWire takes pride in speed as well, and we’ll make sure that we get the materials that you need to you as soon as possible. Although you may be located more than two or three days from our various facilities, we try to get your item to you within that time span. Outside of holidays and weekends, you’re looking at incredibly speedy delivery, even on special orders (although special orders are not returnable). Shopping with us means that you can accomplish whatever job comes at you in a timely manner, and that’s the kind of service that you’ll want for your own customers! The quality of our products matters to us in the same way that our customer service does. We want you to find exactly what you need, and that means that our representatives are knowledgeable about our products and can steer you in the right direction. Feel free to contact us with any questions you might have about our products or what would be best for your current project. Contact us today, and let’s see what EWCSWire can do for you! Hate It When Your Electrical Wire or Cable Isn’t Right? Most folks don’t know about electrical wire cable or wiring at all for that matter. They need a resource who can walk them through the jungle of cables and wiring without getting them all tangled up. Electric Wire and Cable Specialists is here to help. Since 1994, professionals and DIY’ers have turned to EWCS to solve their standard, specialized, and even custom wiring projects. Don’t know anything at all about electrical wire and cable? That’s okay. We know it all. EWCS can answer all your questions and solve all your problems so you don’t have to search and search for solutions. No more going to two or three suppliers to get what you want. EWCS has it all. Aluminum, copper, electrical, electronic, instrumentation, welding, power, and even marine wiring solutions are at your fingertips. Just go to www.ewcs.com and you’ll find not only the answers to your questions, but solutions to your problems. With seven service centers across America, EWCS we strive to supply your products in two days or less! EWCS has the trained sales professionals you’re looking for to solve those nasty, time-consuming integration problems when products need special attention in order to make everything work properly. With a quarter century of experience, we have the knowledge, experience, engineering, and specialization that many projects require for completion. Offshore companies can promise only one thing – cheap prices. We promise products made only in the USA, engineered to last, and designed to meet the most difficult specifications and applications. Confused about where to begin? We can help get your project started on the right foot with our engineering and application expertise. Unsure about correct specifications for your project? Our customer service experts have supported all kinds of projects from laboratory experiments to huge industrial complexes under construction. Delivery is the final step for every order and we make sure you get what you need, when and where you need it. Our seven service centers work together to insure your products arrive on time, ready for use or installation. If something isn’t right, we will make it right – immediately. Our thousands of customers will tell you, we don’t stop working until the order is received and accepted. It doesn’t make sense to have the best products without the best product support and we know it. Got a really tough engineering design for specialized cable or electrical wire that no one else can supply? We can do it. Electric Wire Cable Specialists are exactly what you need. We specialize in the out-of-the-ordinary. Other companies can try and put products together that don’t work, but we won’t do that. Never have, never will. We know each and every customer is counting on us to solve their problems and they know we can do it – quickly, efficiently, and economically. It just doesn’t get better than that. Take a look at our website and give us a call. You’ll find responsive, professional help that can take on that tough specification without hesitation. The tougher the better in our book. How better to prove your value than to be the resource with all the answers and with all the products to support you? If it was easy, everyone would do it; but they don’t. It takes time, experience, and wisdom to become a guru and we are the gurus of electric wiring and cabling, period. Check us out at www.ewcswire.com and you’ll find what many others have discovered – satisfaction. Choosing and maintaining the right welding cable is crucial to your success. How can you ensure that the one you have chosen is the right one for your job and that it is safe and effective to use? With dozens of brands, materials, and sizes, it can seem like there are an overwhelming amount of choices out there. You need a cable that is cost-effective, reliable, and of course, safe, so you can rest easy that your gear will keep you and your clients happy. But what specific knowledge do you need in order to be certain you are choosing the right cable? There are several important features that anyone who works with welding equipment should know in order to make sure they have the right cables for the job. The first item to consider is the cable’s material. Welding cables are typically made from copper or aluminum and knowing the difference is an important part of getting your job done right. Copper is a better conductor of electricity than aluminum and requires less maintenance. It can be safer to use than aluminum and there is less risk of causing a fire. Balancing costs with quality as an important practice for your business but keep in mind the differences between the two wires is very distinct. Be sure that you are selecting the correct gauge for your welding cable as well. Just like how a garden hose of a larger diameter can pass more water, a larger cable can pass more electricity. Be sure that the cable you choose is the correct one for the job you need to do. Length, too, is an important factor. A shorter cable run is rated for more ampacity than a longer cable run. We have a handy chart to help you size your welding cable appropriately. There are two things one needs to know in order to choose the right cable for welding. The first of these is how long the welding circuit is. This simply means that you need to know the whole path your cable is following. Next, you will need to know the maximum amperage you will use. This is often found on your welding machine and easily accessible. At EWCSWire, we know how important it is to have the right tools and cables for the job you are about to undertake. Our years of experience place us at the forefront of the industry enabling us to assist you in any job, big or small, that comes your way. Whether you need help choosing the correct cable size, you are not sure if you should choose aluminum or copper, or you simply do not yet know what tools you will need, be sure to ask our experts and we will get you back to work in a fast, safe, and reliable way so that you get the job done right. EWCSWire is the electric wire and cable specialist for all your wiring and cable needs. 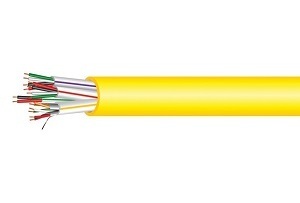 Since 1994, we have provided low prices and high quality cables of different sizes. Any type of situation you may find yourself in, we are sure to have a solution for it. From aluminum cables to electronic, copper, welding, and marine battery cables and terminals, you can turn to us. We also take special orders for cables sizes and cut them down to smaller lengths for your convenience. We care about our customers and reply to all the questions you may have. We also ship all cable orders within 3 business days, excluding holidays and weekends. Our specialty is immediate shipment, so you can always count on EWCSWire to quickly prepare and ship your order, no matter how big or small, so that you can get the job done. Our marine battery cables and terminals are made of high quality materials right here in the United States and are all ABYC and UL approved. These cables are also made from heavy tinned copper conductors and can be customized to fit any length you may need them in. 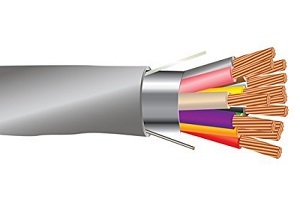 Our four different selections are a good match for any of your cable needs, from 16-10 UL, 8-4/0 UL, flat marine power cables, and marine grade adhesive lined shrink cables; we make sure you are getting the best quality product you need. Our 16-10 Gauge UL approved marine primary wire comes in four different gauges to match your needs: 16, 14, 12, and 10 AWG and are all UL approved, marine primary, and tinned. Our 8-4/0 gauge UL approved marine battery cable also comes in many sizes: 8, 6, 4, 2, 1/0, 2/0, 4/0 for all your battery cable needs. Our flat marine power cables come in five different sizes for your convenience, with three marine cables featuring a 2 conductor UL and USCG approved cable, and two cables featuring a 3 conductor UL. Our UL approved marine approved adhesives will be able to seal up the connection between the wire and terminal. The double wall adhesive made from polyolefin shrinks with heat to provide a strain-free connection. Order in packages of 6 pieces that come in 6 inches for only $7.95. We also have a very large stock of aluminum cables that can be ordered in a triplex or quadraplex design. These come in different gauge sizes and voltages to fit your needs. Our aluminum cables with voltages are designed for use in heavy-duty situations. 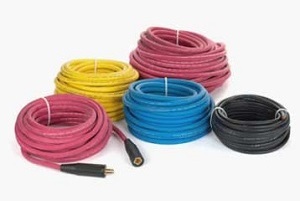 One of our 600-volt cables, 4/0 AWG AL Aerial Triplex XLP (Cross-Linked Polyethylene) cable, comes in four different sizes and can handle both dry and wet applications as well as a temperature of 90 degrees Celsius. 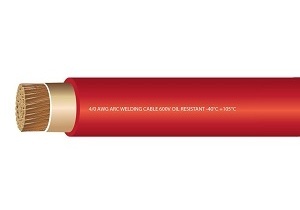 The Aerial Triplex XLP cables are truly designed to withstand extreme loads with steel support. EWCSWire is here to make sure you are satisfied, and that is why we offer a 100% guarantee on customer satisfaction. Order your cables today and we will ship in 3 days from our stock. You put a lot of time and money into your boat and when things go wrong, it can often mean a lot more cash laid out and lot of headaches for you. Sometimes it seems like Murphy’s Law applies to boats more than anything else – what can go wrong, will go wrong. But in the end, parts break, accidents happen, and try as you might, you can truly prevent things from breaking. Often, marine electrical wire needs replacing and when that happens you need to be able to diagnose the problem and determine the best solution that will get you back on the water as fast as possible without breaking the bank. When it comes to your boat’s health, the battery can be a chief source of frustration. Boat batteries are designed to hold up to the elements, and on the water they are put to the test. Modern marine electrical wire takes advantage of the latest technology to keep the juice flowing no matter what nature throws at it. So, how do you know if the problem even lies with your boat’s battery? The most common way is by noticing a problem with your boat’s electrical system. After that, there are some simple tests to run to isolate the issue. First, you will need to determine if your battery is running too low on power. Flip the switch that will move the outboard down and up once and see if it is capable of completing the operation. If so, you should have enough juice and you can move on to other things. Rule out a simple user error by making sure that the boat is in a neutral throttle position before attempting to engage. Be sure to move it in and out of position a few times to ensure it is correct. Once you have determined that the throttle is indeed in the correct position, now it is time to check on the battery. A common cause for electrical issues is corrosion. See to it that your battery, its cables, and connections are free from any corrosive material or rust and that every connection is clean. Perform regular maintenance on your boat and be sure that battery care is part of your routine. Ensure that other electrical devices are powered as well. The problem may reside in another component other than the battery. You may need a replacement cable, or a piece of equipment, such as your alternator, may be broken. At EWCSWire, our experts are ready to help you with any of your marine cable or electrical equipment issues. We couple our years of experience with the latest in technology and top of the line products to offer you the very best in your electrical equipment needs. Consult with us and we are happy to help you get your boat’s troubles resolved and get you back to the surf as quickly as possible. After all, our mission is connecting contractors, electricians. and everyday people with the right gear they need to get the job done quickly and easily. 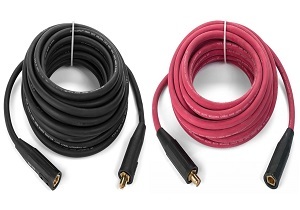 Looking To Bulk Up On Cables and Wires? Do you feel that you’ve got the materials that you need to do your job correctly? If you know exactly what you’ll be working with, it’s always smart to keep a decent amount of cables and wires on hand. That way, you won’t risk putting off a job to wait for supplies. The best place for you to stock up on your cables and wires is EWCSWire.com. At EWCSWire, we’ve been selling cables and wires and cable and wire accessories for well over twenty years. Since 1994, we’ve been a leader in the industry, providing the highest quality products to needy customers and technicians around the country. With welding cable for sale, you’d be hard pressed not to take advantage of the great bargains that EWCSWire has to offer! There are quite a lot of options to choose from too, so when EWCSWire says we having welding cable for sale, we mean any welding cable that you need to finish your project! If you work in the industry, you understand that cable costs can accumulate, leaving a pretty hefty dent in your wallet. That’s why our cables are at the best prices around; you don’t need to worry about money or quality when you get the best of both worlds! There’s simply no better feeling than snagging a bargain, so come on down and get yourself the deal that you deserve! As far as other cables and wires go, we’re not just touting our expertise; we are the experts of the industry. You won’t be able to find this many products in one place that offer the same quality and price, and that’s a promise. No matter what wire or cable you’re looking for, we’ve got it. Need a 6 gauge welding cable? We’d ask “what kind?” We’ve got variety, and that’s what matters most in this business. If you want to stay prepared for whatever your job might throw at you, it’s always a smart idea to stock up on the most commonly used cables and wires. There’s no better place to do that than EWCSWire. Another benefit that you’ll get from shopping with us is fast delivery! Even if you aren’t stocked up on all the items you need, you’ll be able to acquire whatever cable or wire you need in a very short amount of time. Our orders typically ship within 24 hours after you’ve placed an order from multiple fulfillment centers around the country. These are shipped on workdays or business days only, not on weekends. Although it’s possible that you might live a few days away from one of our warehouses, we aim to get your product to you within two to three days. If you need a special order or cut to order wire, these options are non-returnable. There’s nothing that makes us happier than a happy customer, and that’s why we provide these services. No matter what your background is, you’ll be very happy with the service that you find at EWCSWire. That much we know for sure!